Support 2.5″ hard drives (SSD and HDD) and fits all popular PC casings. Fit for two 2.5″ drives providing valuable space for additional PC components. Accessories: 1 x Mounting Kit, 1 x Screw Driver, All Screws Needed, 1x 4 Pin to Dual 15 Pin SATA Power Cable(16 cm), 1x 15 Pin to Dual 15 Pin SATA Power Cable(16 cm), 2x SATA Data Cables(48 cm) . If you want to mount 2.5″ drives into your PC and got a free 3.5″ slot, then this Inateck conversion bracket is the optimal solution meeting you requirements. The frame bracket provides ample space for two SSDs or laptop HDDs measuring 2.5″. The Inateck conversion frame is therefore an efficient solution in casings with limited space for additional storage devices, especially Mini PCs, Server racks, HTPCs or Cube cases. This dual bracket HDD frame is moulded using high-quality alloys, is a precise fit and thus universally supports all common 2.5″ drives. At the same time, a uniform appearance of the PC’s internal is guaranteed. Please note that this mounting bracket supports side mounting only. 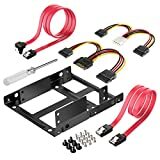 This entry was posted in Computer Desktops and tagged Bracket, Cables, Data, Disk, Drive, Hard, Inateck, inch, Included, Internal, Mounting, Power, SATA, ST1002S by Express Computer Supplies. Bookmark the permalink.